This VB.NET Training Course includes 7 comprehensive VB.NET courses with 21+ hours of video tutorials and Lifetime Access. It is an amazing collection of practical and hands-on learning of the most updated training programs and projects in the area of VB.NET Framework. You will also get verifiable certificates (unique certification number and your unique URL) when you complete each of the 7 courses. 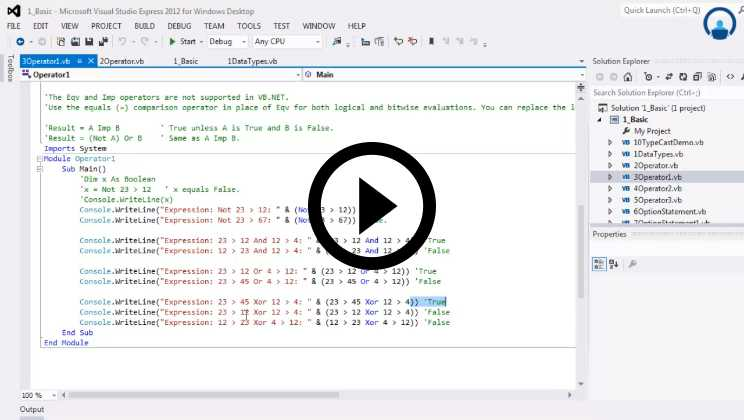 This training will help you learn about VB.NET Concepts, Procedures, Functions and Arrays, Multithreading, Winforms, Printing Reports in WinForms Application. Deal You get access to all 7 courses bundle. You do not need to purchase each course separately. 1 WinForms basics with VB .NET training This VB.NET training course contains several concepts like Introduction to the Visual Studio .NET, its tool box, working with win forms concepts such as forms & controls, textbox control, events & event handling in Win Forms, examples for entry forms and login forms etc. are clearly explained including its conclusion. 2 Ultimate VB .NET series module with the fundamental concepts training In this VB.NET course, the topics included are Visual Basic fundamental concepts such as its introduction, examples of programming in VB .NET, different programming constructs such as decision constructs, looping constructs, if else loops, while loop, end while loop, different practical examples etc. are covered in detail. 3 Ultimate VB .NET series module with the Procedures, Functions and Arrays concepts training In this VB.NET training course, the concepts such as Procedures, Functions and Exception Handling topics are explained. Also arrays, enumerations and structures with object-oriented programming, properties and methods, constructors and destructors. 4 Ultimate VB .NET series module with the overloading and interfaces concepts training In this VB.NET course, the topics covered are Overloading, Inheritance and overriding with some additional examples are also explained with hands on practical examples. 5 Ultimate VB .NET series module with the multi-threading and garbage concepts training In this VB.NET certification course, the concepts of events and delegates, multi-threading and garbage collection, inheriting events, garbage collectors, multithreading and garbage collection with a greater number of examples. 6 Ultimate VB .NET series module with the databases and assemblies’ concepts training In this VB.NET training course, the databases and assemblies with its working and configurations are explained. It also covers working with ADO .NET using VB .NET with different life cycles of components, private and shared assemblies, globalization and localization, creation of custom attributes etc. are explained. 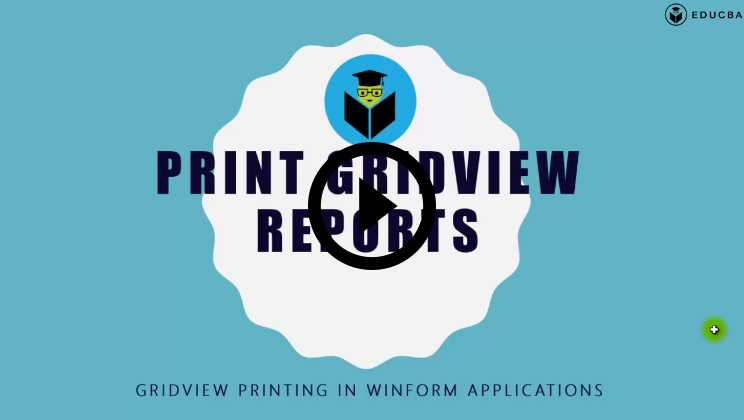 7 Printing reports in Win Forms application In this VB.NET course, you will be learning on the concepts such as Introduction to printing reports in Win Forms application, demo setup, printing data, print options, checkbox and dropdown controls in printing columns, auto fit to page width. VB.NET is an object-oriented programming language which is built on top of the .NET framework based on the .NET technologies developed by Microsoft Corporation. It was influenced by BASIC and Visual Basic programming languages and their features were taken as a base to develop this VB.NET programming language. VB.NET supports complete object-oriented concepts. VB.NET is easier to learn the course, structured, component-based, a general-purpose programming language that supports a variety of platforms. It has strong features in its programming language such as a standard library, events and properties, generics, condition compilations, indexers, multithreading, assembly features, automated garbage collection, event management, and delegations. Using VB.NET programming, various applications can be developed on top of .NET framework such as web applications, web services, windows applications etc. This language can be used with any of the programming languages such as C, C++, C#, COBOL or JScript etc. VB.NET programming code can be developed by using any of the Integrated Development Environments (IDEs) such as Visual Web Developer, Visual Studio, Visual Basic Express etc. The compilation and execution of the VB .NET programs can be done easily in any of the above IDEs mentioned above. There are several number skills those which can be easily mastered on completion of this VB .NET course are like ASP.NET, ADO.NET, AJAX and few .NET based framework modules along with .NET languages and its relative web-based application frameworks including several third-party integration features. VB.NET course contains several modules such as web application frameworks having some set of different .NET related core skills like application programming features, different APIs, object-oriented programming constructs, .NET library APIs etc. in multiple application development environments. There are also, multiple parts of the .NET framework applications such as WCF, WF, WPF which are core part of web application development can be carried out easily by learning this VB.NET course. There are also several other VB.NET course-related topics such as Windows forms, metadata and assemblies, and its related core concepts can also be learned easily. This VB.NET course has a set of multiple skills such as .NET technologies related frameworks or libraries such as Win Forms, Event Handlers, Delegation, Garbage Collection etc. This VB.NET course contains some custom applications which were developed from scratch to give the learner a complete understanding of the application from the beginning in a real-time mode. This VB.NET course also serves the purpose of Microsoft related technologies and different frameworks. Willingness to pursue a career as VB .NET or VB Developer: The VB.NET course has some prerequisites to be fulfilled before beginning with the VB.NET course as a basic programming knowledge from .NET technologies. This VB.NET course requires some intermediate knowledge in any object-oriented programming language or any previous working experience in the high-level programming languages area or object-oriented languages like C++ or Java or C# are an added benefit to this VB.NET course. This VB.NET course may become difficult for a starter or fresher without having any experience or extensive knowledge in any other object-oriented programming language. Knowledge in Web or standalone application-based .NET frameworks: Any previous experience or knowledge in the standalone or web-based applications from the Visual Basic or .NET technologies from the Microsoft will give an easier starting boost for the learners of this course and can easily pick this course with ease of learning. Any engineering or bachelor degree in computer science area or related technical or engineering discipline will also make the learner comfortable in learning this VB.NET course. Students of Technology / Engineering in CS: If you are a Bachelor degree holder in engineering or technology related fields especially in computer science degree or any other computer related technical engineering discipline, then the benefit of learning this VB.NET certification course will add a lot of benefits in a shorter period. This is also recommended for the career betterment in a shorter time in all aspects. This VB.NET course is a comprehensive package module for the learners to be enable to learn the course contents with a greater extensive knowledge along with some hands-on training. VB .NET or VB Developer Software Professionals: Someone who is willing to excel their technological career as a VB Developer or VB.NET Developer can opt for this VB.NET course with no other thoughts directly. This VB.NET course is definitely and highly recommended course for a VB.NET Developer or VB Developer or Support Engineer in the Computer Science Profession. CS Bachelors or Masters: Any CS bachelors or masters in engineering graduation or post-graduation can opt this VB .NET course to prepare of any interview or any job training to fulfill the business requirements easily. Why should I do this VB.NETcourse? Any VB Developer or VB .NET development professional who is willing to learn VB .NET technology or who wants to pursue an excellent career as VB .NET developer should pursue this VB .NET certification course. This will enable the learner to master the course easily with no hurdles because of the design of this VB.NET course curriculum. I don’t have a background in computers or technical engineering, can this VB .NET Course still be considered a good option? YES, this cannot be easily learned without any computers or technical engineering educational background as this VB.NET course requires some additional knowledge in object oriented programming background but still this can be achieved if someone has experience in developing computer programming related projects from their graduate coursework. Would this VB.NET training course add value to my profession? Yes. definitely, this course would add value to your profession and also great benefits including certifications as well. Is this a quick-fix to clear interview or do I still need to practice continuously while learning this VB .NET Certification Course? Yes, this will be a quick-fix if you are already at an intermediate level in handling this technology and No, if you are zero in computers as this VB.NET course contents are very comprehensive which has more than 21 hours, it needs some previous knowledge or experience or experimenting on this VB.NET course to easily learn this course contents. 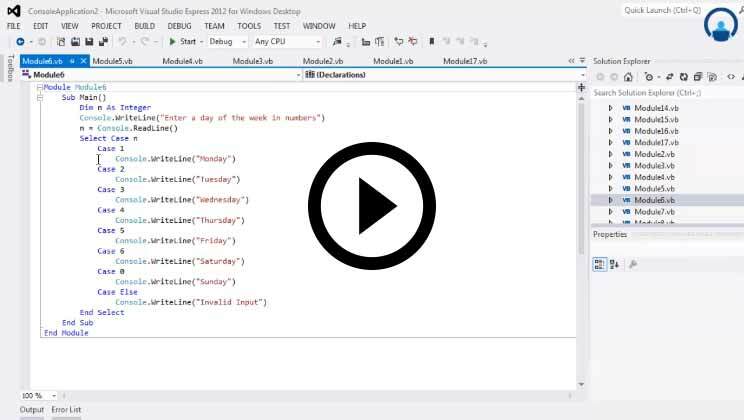 This VB.NET course is a great refresher for an experienced VB developer or VB.NET developer. Even, any computer professional can learn this VB.NET course with ease of manner which contains many topics explained in an elaborated way including several concepts embedded in videos with hands on to give greater experience to the learner. There are also many career benefits on choosing this VB.NET course which will be obtained post completion of this VB.NET course such as in-depth technical knowledge apart from hands on and also extensive outer areas of other .NET related technologies with strong foundations of the technical concepts. There are also several set of skills that can be gained from this VB.NET course which are in high demand in the industry currently in terms of the customer business requirements and also many developers and technical architects for several positions and roles. The course is excellent for beginners, it covers everything you need to be able to build complex programs. The accent is understandable, sometimes the voice goes a bit to high. In this course you can learn even about multi threading winch I found really useful so that your program can use all the resources of a modern computer. There is even a training related to the database connections, so as you can see it covers everything you need to be able to build complex programs as I stated at first. This is highly recommended course for the VB developer aspirants in the area of web application technology development for VB.NET applications using VB programming. This VB.NET course on VB training has lot of hands on training and is great to learn in an ease of manner. 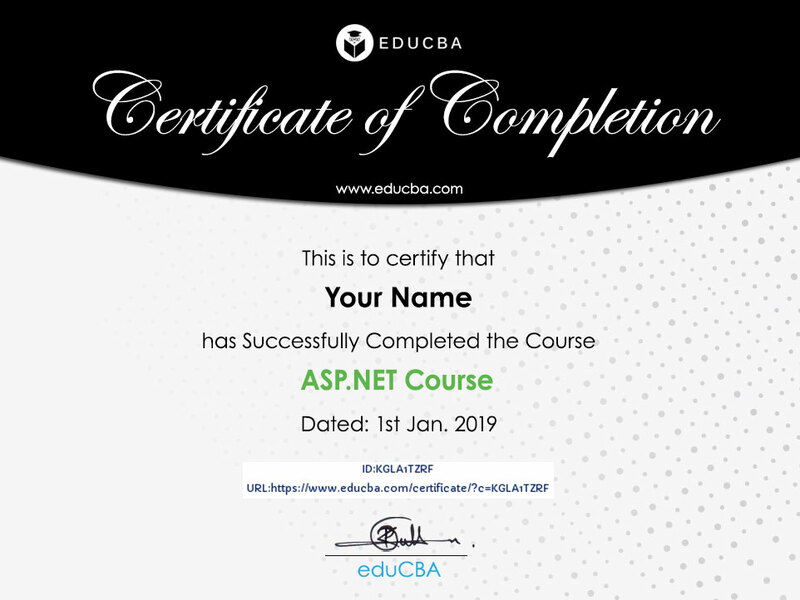 I have chosen this just because the previous courses from EduCBA courses had helped me a lot in gaining lot of technical knowledge as well as hands one experience level confidence apart from this VB.NET course. This is the excellent course curriculum from EduCBA as this VB.NET course is well framed from its topics perspective and its concept from difficulty level up to easy of the learning journey.